In March, SmartKey password recovery tool developer was released a long-awaited update version of Password Recovery Bundle called Password Recovery Bundle Enterprise. It inherits the effectiveness and easiness of Password Recovery Bundle but stands out with many new feature and improved functionality. In order to meet March, the blossom season, as long as thank new and old customers! 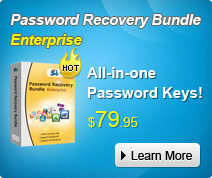 Customers who buy Password Recovery Bundle Enterprise in this month will get 19% off discount. Not to be missed. Before you buy the software, understand its new feature and improved functionality while compared with the various password recovery bundle. I think the biggest feature of Password Recovery Bundle Enterprise is that it can reset the Windows domain password if you forgot your windows server domain password. As far as we know, nowadays so many PC users use Windows server as a workstation. A windows domain is a logical group of computers share a central directory database. Each person who uses computers within a domain receives their own account and uses this account they can get access to resources within the domain. If you have lost windows server local admin password, I think it is easy for you to recover the password. But what if you have lost windows domain password? You will get trickier in the past but now Password Recovery Bundle Enterprise will help you get rid of that tricky. Reset Windows local account passwords or domain passwords on Windows XP / VISTA / 7/2008 / 2003 / 2000 etc. Allowed to offer password clues if you remember part of the password to save time. The fastest, easiest and least expensive on the market. Why wait? Come and buy right now since a special discount of 19% will only be offered for a month. Just imagine how convenience you are when you own a must-have password recovery toolkit whenever you forgot or lost any password.